When I returned from a recent trip, I was met at the door by this poor little fellow: our dog, Laddie, who had visited the vet earlier in the day. Two stitches in his left eyelid. Ouch! If this had happened to me (especially those stitches) I’d be a bed case for a week. 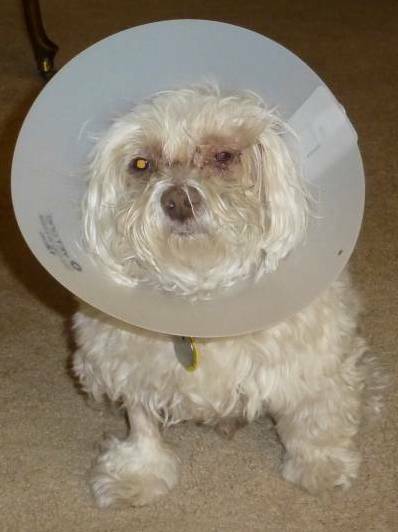 I wouldn’t be wearing the collar, though, because I think I could be trusted not to scratch the stitches. P.S. The biopsy on the eyelid bumps came back negative, so Laddie won’t stay a miserable, sick pooch for long! Awww! Poor little guy. I hate it when my pets get sick. Sending waves of healing. Pets seem so helpless when ill, don’t they? Of course, dogs have got that ‘poor me’ look down pat even when they aren’t ill; but when they really have a problem, they’re thoroughly stoic. Thanks for the ‘waves of healing’. He can use not only the healing but, since he couldn’t have a bath for a week, the waves, too, to wash some of the gunk off his face!